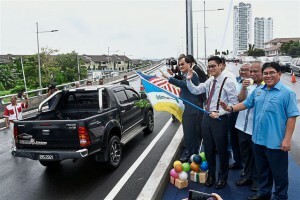 Motorists can look forward to breezier travelling along the newly upgraded 1.25km stretch from Batu Maung to Jalan Sultan Azlan Shah in Bayan Lepas, Penang. The RM123mil project includes the construction of a 650m four-lane flyover, upgrading of roads from the section in front of SK Batu Maung to Solok Bayan Lepas intersection, and beautification of the roundabout beneath the flyover. Works Minister Baru Bian said the project, which was approved during the 10th Malaysia Plan (2011-2015), was completed as scheduled on June 29. He said the project would benefit the local community and bring positive impact to the local socio-economy. “The project is meant to accommodate the increasing number of vehicles from the Sultan Abdul Halim Mu’adzam Shah Bridge to Jalan Sultan Azlan Shah and the Penang International Airport. “The upgraded road is capable of catering to 80,000 vehicles daily. “With smoother traffic flow, road users coming from the Bayan Lepas Free Industrial Zone and Permatang Damar Laut would save time travelling to the other side. “It can also cater to further development in the area,” he said after opening the road yesterday. Also present were Works Ministry deputy secretary-general Datuk Abdul Razak Jaafar and state Public Works, Utilities and Flood Mitigation Committee chairman Zairil Khir Johari.